Government-approved raw sewage dumps compromise water quality and put species at risk against the wishes of local Mohawk and Francophone communities. whatever else people and industry (irresponsibly) put down their drain. A fundamental aspect of this issue is that decisions on waste management are made exclusively by municipalities, without adequate consultation of local stakeholders and Indigenous communities who are impacted by the resulting ecological damage. This reflects a greater structural power imbalance that has been formed through long histories of colonial conquest and exploitation. Some of the visible impacts of these processes are the widespread displacement of Indigenous communities; loss of traditional knowledge, practices, and livelihood; and loss of biodiversity in the St Lawrence ecosystem. In 2015 the sewage dump in Montreal was protested by both Indigenous communities and other activists. An online petition garnered over 95,000 signatures while Kahnawake Mohawks blocked an access ramp to the Mercier Bridge to protest the sewage dump into the St. Lawrence River and held a railway protest. The Federal Government also also ordered for the city to put the plan on hold while Environment Canada conducted an independent scientific review. In the end the city dumped 4.9 billion liters, down from the initial proposed 8 billion. These raw sewage dumps occur to allow for infrastructure repair, with the justification by government officials that there is no better alternative and that there will be no resulting environmental damage. The lack of impact on treated drinking water is held as evidence for that claim. This overlooks the proven toxicity levels found in aquatic species, such as the Beluga whale, that have accumulated over long periods of time from various sources of industrial pollution. A comprehensive environmental impact assessment is needed in order to truly understand the potential damage that high levels of raw sewage will have on the ecosystem. This assessment must also be conducted independently from the entities that approve the dumps. online petition that garnered over 95,000 signatures; activists and concerned citizens participated in a clean-up of the shores around the Old Port – a symbolic gesture meant to say “we don’t want any more waste in our river.”; Kahnawake Mohawks blocked an access ramp to the Mercier Bridge to protest the sewage dump into the St. Lawrence River. Other Loss of eco-tourism potential. Development of Alternatives Critics claimed that Montreal had years to come up with another plan which could have entailed building a back-up interceptor for example, amongst other options. The Fisheries Act, specifically the The Wastewater Systems Effluent Regulations. 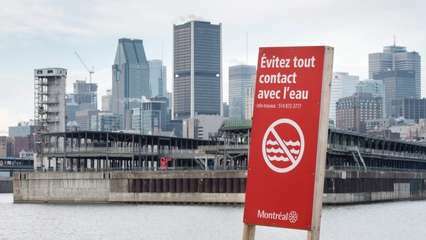 CBC "Longueuil to dump 160 million litres of raw sewage into St. Lawrence River"
CBC "Quebec City to dump 46 million litres of sewage waste into St. Lawrence River"
CBC "Flushgate a success but lacked 'social acceptability:' Denis Coderre "
"Your guide to Montreal's hidden Indigenous character"
"Kahnawake Mohawks hold railway protest against planned sewage dump"
"Call of the Baby Beluga"